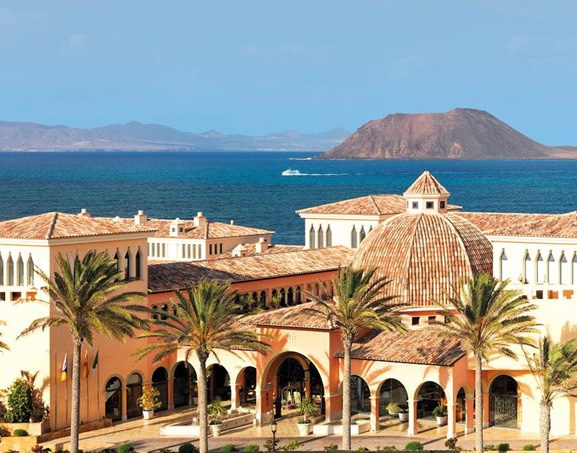 The stunning 5 star Gran Hotel Atlantis Bahia Real is one of the best hotels in Fuerteventura, situated on one of the most attractive corners of the island with idyllic views towards the neighbouring islands of Los Lobos and Lanzarote. 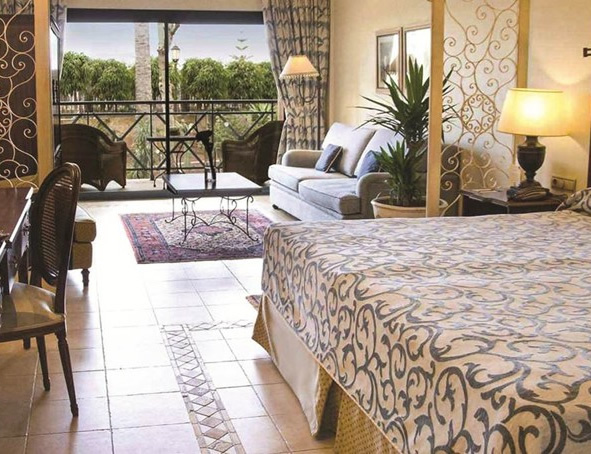 The hotel is located directly on the seafront at the southern edge of the resort of Corralejo, this ornate luxury hotel lies approximately one and half miles from the centre of the town and 26 miles north of Fuerteventura airport. The 242 guest rooms, like the public rooms throughout this impressive property are luxurious and well equipped, with in-room safe, mini-bar, interactive satellite TV, internet access, air conditioning, heating, hairdryer, writing desk, dressing gown, slippers and pillow menu. Every room is tastefully decorated, equipped with luxury en suite bathrooms creating a comfortable atmosphere. Dining is a real experience at the Gran Hotel Atlantis Fuerteventura, the choice is fantastic starting with the restaurant La Cupula de Carles Gaig featuring a Michelin star Spanish Chef of international reputation.Restaurant Yamatori: Japanese cuisine, restaurant La Alacena serving buffet-style which comprises home- made breakfast and international dishes also there is the restaurant Las Palmeras this gives guests the option to enjoy a delicious meal outdoors. For a refreshing drink there are also a few bars to choose from: Piano Bar La Boheme: where guests can enjoy a cocktail while listening to piano music. Lobby Bar el Mirador, the Lobby bar and Lounge bar offering exquisite service and cocktail menu. 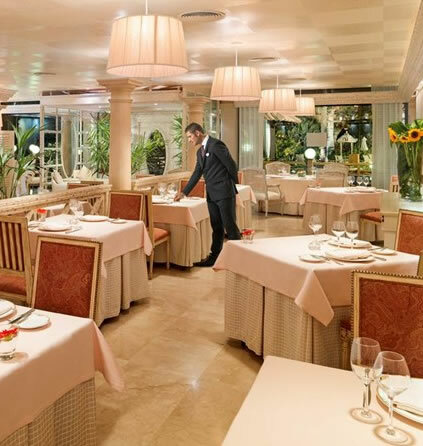 The hotel has a host of facilities to enhance your holiday pleasure, hidden in the heart of lush tropical gardens are the two lagoon-style pools, both are bordered by extensive terraces, dotted with sun loungers and parasols. If you can drag yourself away from your comfy sunbed there is gym and fitness centre, sauna, beautician and a hairdresser on site. Young children staying at the Hotel Atlantis Bahia Real can enjoy 6 days a week of a varied programme of children animation and a mini disco in the afternoon. For bigger children up to 7 years there is a corner with Play stations and table games. The hotel also provides a regular programme of evening entertainment. 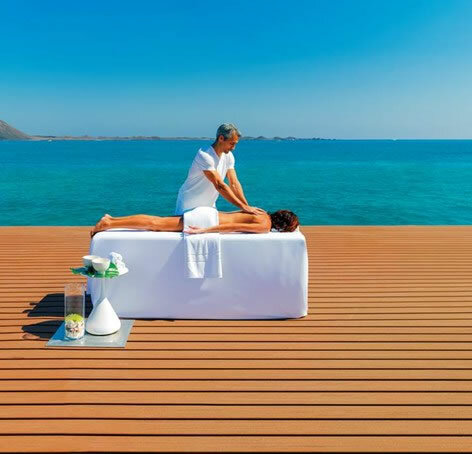 The Spa facilities are equally outstanding as the other parts of the Hotel Atlantis Bahia Real, they feature 3000 sq metres of facilities to provide health and relaxation. Guest can choose from seventeen treatment areas and rooms with the latest technology in health and beauty care. 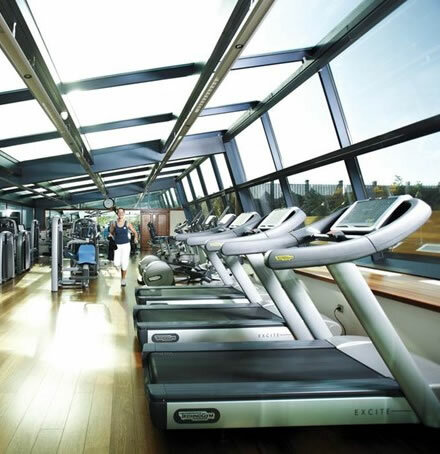 Facilities at the Bahia Vital Spa include heated swimming pool with a sub-aquatic massage circuit, shower temple, hydro jet, Turkish baths, sauna, oriental rasulbath and outside Jacuzzi and a well equipped gym.